As the 18th century closed, treaties were signed and the frontier moved west. Among the Americans who volunteered from Kentucky in the War of 1812 were many veterans of the Revolution and the bloody frontier conflict that consumed the Ohio Valley and southern Appalachians for years afterward. 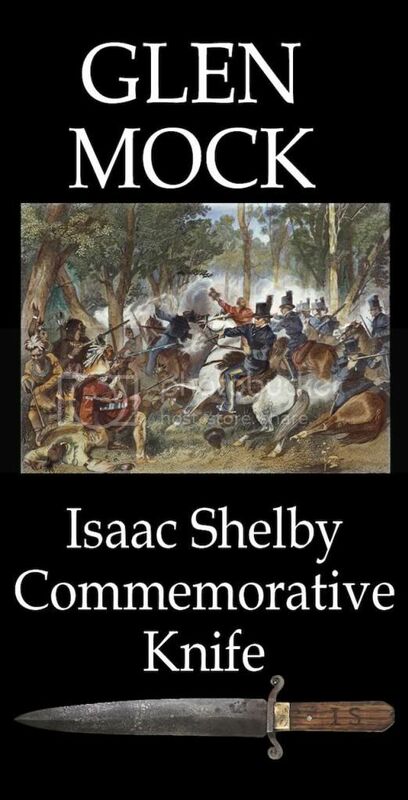 Isaac Shelby served as a soldier in Lord Dunmore’s War, the Revolutionary War, and the War of 1812. While governor of Kentucky, at age 63 he personally led the Kentucky militia in the Battle of the Thames on October 5, 1813, and was rewarded with a Congressional Gold Medal for this action. His 64 year old friend, William Whitley volunteered as a private and would fall on the same part of the Thames battlefield as Tecumseh. Fifty-eight year old Simon Kenton also accompanied the expedition as a scout and interpreter. Glen Mock is a well known CLA artist from Missouri and recognized for his knives and scrimshaw. He has recreated an enigmatic and classic “old veteran” knife from the frontier. The original was featured in Madison Grant’s “The Knife in Homespun America” and is on permanent display at the Museum of Appalachia in Norris, Tennessee. It is attributed to the old Wilderness Road area in Lee County in southwestern Virginia and likely dates to the 1770s era, and according to Grant saw service on the Ohio Valley frontier. Unlike the gilded and engraved presentation swords passed down to museums by families of the well-known leaders in the War, this knife seems to embody the spirit of those old soldiers who never stopped volunteering, were trusted and followed by others in their day, but whose story we will never fully know now. There is a deadly efficient and simple yet well-made look to this dagger. A definitive “long knife” its size and features leave no question as to its intended purpose, and set it apart as something intended for a warrior – rather than an everyday tool. It shows decades of use but obvious great care as a prized possession; unlike most period knives it looks to have never been relegated to the smokehouse or barn; never repurposed or used hard as a farm tool. One can easily imagine such a knife being carried and used by Shelby, Whitley, Kenton, and others – whether on their first trips beyond the mountains or on the last campaign hundreds of miles north of the Ohio; perhaps being retired after that last battle. “I have been shooting black powder since 1968 and since childhood have had a deep love for the past. I spent the 1970’s into the 80’s making a living as a scrimshander, horner and silversmith.The last twenty some years my wife Connie and I have run a guest ranch in Northern Missouri, offering a taste of ranch life to city folks. I raised and broke horses and ran a small cattle operation. We are now retired from the guest ranch and I spend my time blacksmithing and knife making, along with still running the cattle operation. The knife I made for this year’s auction is not a bench copy but a good likeness of a knife, circa 1770, featured in Madison Grant’s book, “The Knife in Homespun America”. I choose this knife as I wanted to create knife like one made by a frontier blacksmith. The blade was forged out of 1095 steel and the guard out of mild steel. The handle I made from an old oak plank I pulled off a fence here on the ranch. The sheath was made from an old piece of leather donated by Tom Bowen, and I made a brass tip like the one in the book. Everyone needs a good story to tell, so I felt I needed to come up with a good one to put with this knife. Isaac Shelby of Kentucky has been a longtime hero of mine and since Shelby was a frontiersman and Indian fighter, a veteran of the Revolution, and fought as a Colonel at King’s Mountain, just an all-around frontier hero – I thought I might make a knife in his honor– this type of old plain knife might be what he might have carried during his early years, when he was fighting Indians at Point Pleasant…Possibly even carved his initials “I.S.” in the handle. In his older years, Shelby was called up again to fight for his country, this time in the War of 1812. What’s this knife got to do with a War of 1812 auction theme? Even though he was a pretty old man by 1813, he served under General Harrison at the Battle of the Thames in 1813 and this type of knife might just have been one carried by him at that time, left over from his younger days. Shelby was found of the saying, “United we stand, Divided we fall” from a favorite song of his so I thought it would be appropriate to add that on a brass plate and attach it to the handle. Kind of a commemoration to his many years of service to his country.